I’ve spent a good deal of time using the Sony UX380N. I was a fan of the original UX180, but could never quite get used to how slow it was. 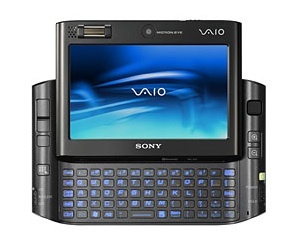 It always felt more like a PDA than a portable computer to me. The UX380N is certainly a marked improvement on the device, which is quite an accomplishment in just six months. It is running Windows Vista Business. I don’t like Windows, in particular Windows XP. Vista is a great improvement to the OS and this device comes with Vista pre-installed. It is fast. The 380N is using a solid state hard disk, has 512meg more memory and is running an Intel Core Solo processor. All of these seem to contribute to a much faster system. In fact, it is downright snappy. Integrated biometrics. Fingerprint authentication works great and is very convenient for a device this size. Also, Sony has bundled a great application which lets you use fingers as hotkeys so that left middle finger can launch Explorer and right index finger can launch Firefox. Integrated dual-cameras. Great for a quick video capture or to use Skype with Video. Integrated Cingular Edge service. Edge is the worst of the cellular data services. I wish Sony would get out of bed with Cingular. Keyboard is still a bit tough to use. Way to many pre-installed apps. I spent the first hour just uninstalling all the crap Sony includes on the device. I wish more companies would take the Alienware approach and leave the installed app baseline at zero. All in all, this is a pretty amazing device. I just wish Apple would come out with a micro PC type model.